Now that Halloween is over, our neighbors to the south are preparing for Thanksgiving, but the next big holiday in Canada is Christmas. For the month of November, I want to fill my freezer with all sorts of savory and sweet treats in preparation for the holiday season. First up are some appetizers. I have become addicted to the savory shortbreads made by Sprucewood Brands. 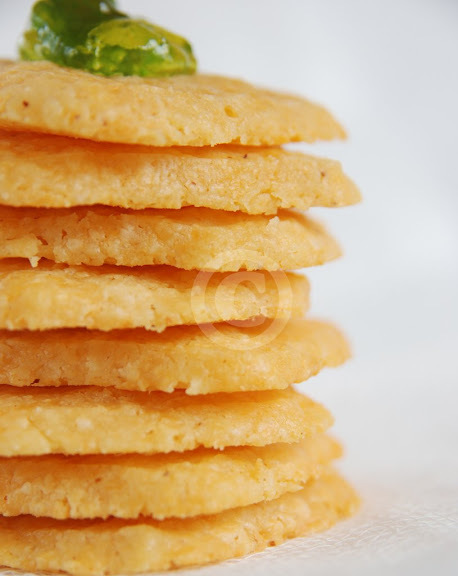 They make a Spicy Thai shortbread that is flaky, crispy, spicy and perfect on their own or with a dip. Their Curry, Rosemary and Original versions are delicious too. I have my own version of this slice-and-bake Cheddar Shortbread that is perfect for an appetizer, a cocktail party, a wine tasting or just to set out with a red pepper or green jalapeño jelly. You could serve some smoked salmon on top or sprinkle some chopped pecans or pistachios on the rounds before baking them. You could even use a different cheese to change it up, such as a blue cheese. 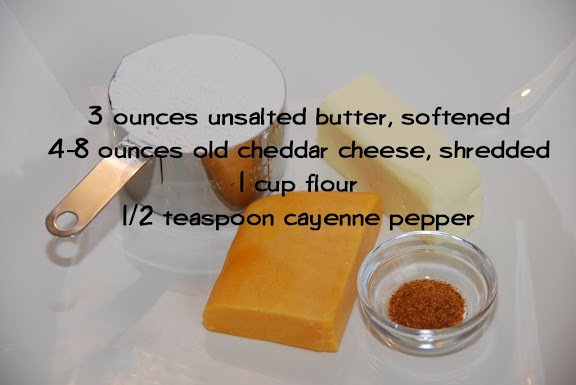 As well, you can add the minimum suggested amount of cheese or more for a richer, cheesier taste. This is a very versatile base recipe. The shortbread will spread a bit in the oven, so make sure you chill the dough before baking. In a food processor, mix the butter, cheese, flour and cayenne pepper with the metal blade until the dough forms a ball. Roll the dough into a log. (You can freeze the logs by wrapping them in plastic wrap and put them in a freezer bag. Thaw overnight in the refrigerator before baking.) Slice into ¼-inch rounds and place on baking sheet. Chill for 1 hour in the refrigerator or ½ an hour in the freezer. Preheat oven to 350˚F. Bake for 17-20 minutes, or until light brown. Let cool. oh my these look sooooo yummay! i wish i lived in your household! you always make the most delicious things! I sometimes wish we celebrated Thanksgiving in October too, just to spread things out a bit! These look wonderful - thanks for all the suggestions. If I made this, I doubt there would be enough dough left to freeze after I finished 'testing' it. This is something I just have to try. Might put some herbs and parmesan to change it out sometimes. Thanks. These look really good. Savory shortbread sounds wonderful. I love sweet shortbread, I bet I would love these more. Excellent idea. What a wonderful recipe. A great staple to have in the freezer during the holiday months. Looks sooo easy and I know it taste great. Just look at those ingredients!!! Love shortbread, sweet or savory. In the Southern region of America, we call these Cheese Straws. They are ubiquitous at baby and wedding showers/receptions! I love them! Sometimes, we sprinkle them with powdered sugar. Love savory - these look great! Thanks for the recipe! Oh. My. Goodness. I cannot make this unless company is coming - I know I would consume the entire batch! Thanks so much for the recipe! I would love these! What a great idea to get a head start on holiday baking-I'll bet those freeze really well. Ciao !They look great ! I should try them with pecorino or parmigiano as we don't have cheddar here ! dessertobsessed - I'm going to have to freeze the baked versions too so that I don't overdo it! audrey - It is nice to have it all spaced out a bit. liz c - They're very addictive. Especially with the spice. jacqui - I like your idea of adding herbs and parmesan. megan - I hope they last until the holidays! little towhee - Interesting to know what they're called elsewhere. sandy smith - Yup, they're best made for company! veronica - Both the unbaked and baked versions freeze well. natalia - Interesting to know you don't have cheddar! Pecorino or parmigiano would be great too, I'm sure. my mom makes something much like this, and it's always devoured. easy, versatile, and delicious--what could be better? These are beautiful! My sister-in-law bought something similar at the farmer's market a couple weeks ago-- it was $11 for 5 little rounds! I'll definitely be passing this recipe on to her. I'm Canadian too, but my parents are American, and we celebrate both. One down, one more to go. I love your idea of filling the freezer before the holidays. grace - It is a great crowd-pleaser! hanne - Wow, we should start selling them! I've made these a few times, usually with 2 year white cheddar. I found that 17 minutes was far too much time and the rounds were too cooked (they never turned brown with too much time). 9 minutes seems to be the lucky time for me. Currently making this again for New Years. One with Tillamook Private Reserve white cheddar, smoked in my smoker; the other with Blue Cheese crumbles. One thing everyone who tries them is surprised at is how cheesy they are at first and then the impending slow burn from the cayenne -- just enough to make them want another to offset the burn with more cheese! I just stumbled upon this recipe, and it looks fabulous! I will have to try these soon.